Below are the 1991-2007 Tomos controls, made by Hidria Rotomatika (HR). They’re sliding block type with HR-made integral switches. They are also on Volocci electric mopeds. Ci.Te. 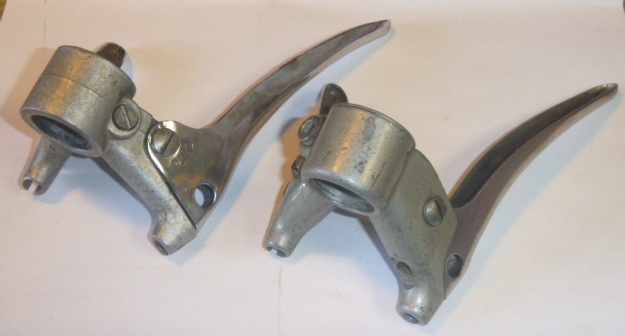 is an Italian moped lever used on 1960’s and early 1970’s Italian mopeds. 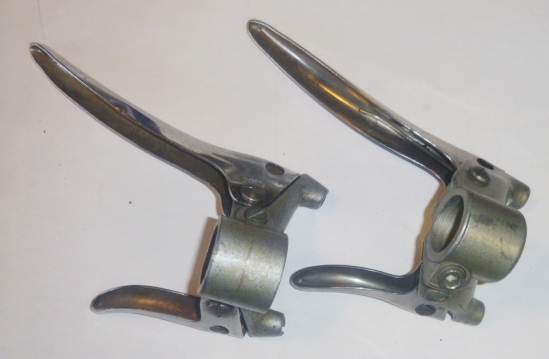 They are similar to 1970’s Domino levers. You can see that in the side-by-side comparisons below. Domino blades have the D9 special stepped tube 6mm ID, that snaps into the 8mm pivot hole, to spread out the load over a large area. Ci.Te. 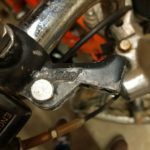 levers are more primitive in that the blades rub on the pivot bolt in just two places, and so the pivot bolt gets cut by the sharp edge of the folded sheet metal. Domino levers also have assist springs, but Ci.Te. levers do not. Ci.Te. controls have no facility for mounting brake light switches. Ci.Te. lever blades do not have balls on the end. These last two things are required on USA mopeds. So therefore Ci.Te. levers are rare in the USA. 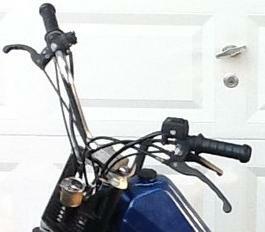 Out of almost 1000 moped levers, new and used, mostly Magura and Domino, there was only one Ci.Te. lever blade. That is how rare they are in Southern California 1970’s -1990’s 20 moped shops leftover parts inventories plus 100’s of local mopeds turned into parts. O.S.L. 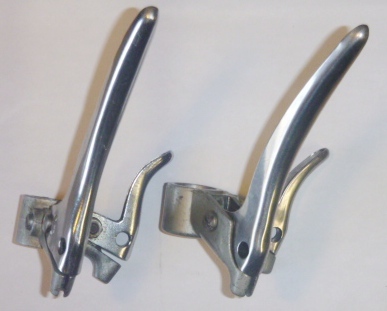 levers are heavy duty and high quality Italian controls, used on some mid to late 1980’s US model mopeds including Safari, Benvenuti, and Cosmo (Colt). They look like Domino, except for the kink in the middle of the lever. Myrons does not have any OSL controls or levers for sale. They were (almost) never on any mopeds sold in California. 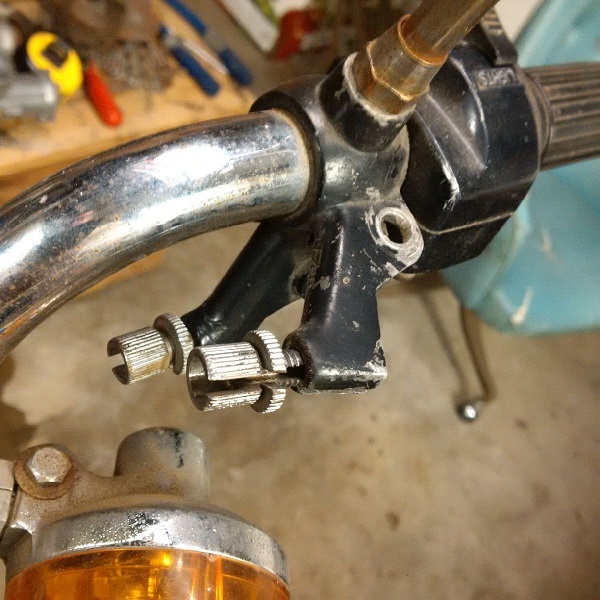 Out of a thousand moped levers at MM, this is the only OSL sample. P.V. 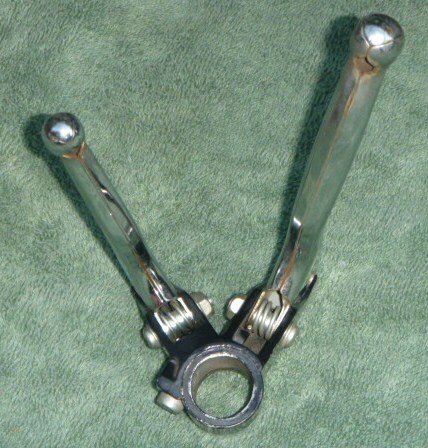 is an Italian moped lever, used on Intramotor Gloria, Testi/Gitane, Califfo and other “early” Italian mopeds. None of the parts interchange with Domino. 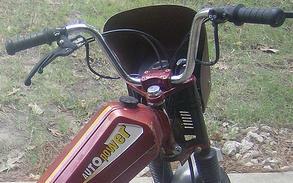 The lever blades are all black plastic, as are the throttle twist tubes. 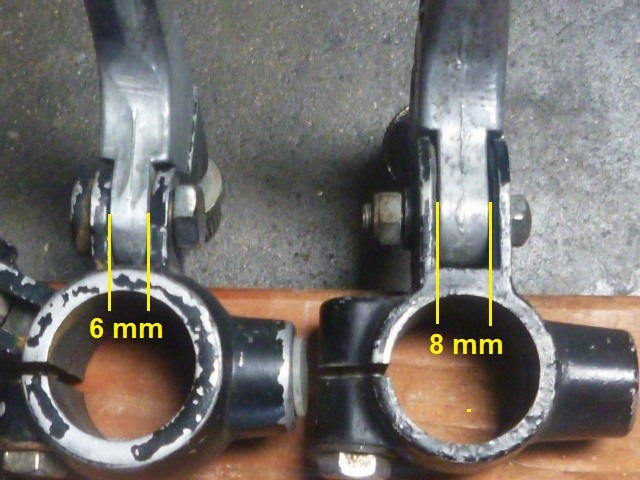 The housings are cast aluminum. 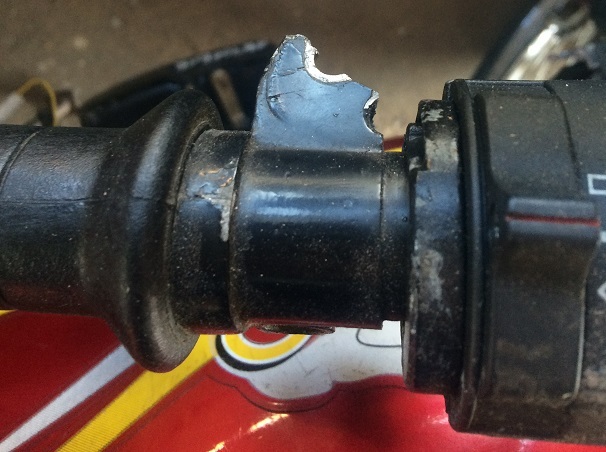 The housings break easily when the bike falls over. Instead of a pivot bolt they have a press-in 6mm roll pin. At left are all the PV levers, out of hundreds of Magura, hundreds of Domino, and dozens of Motobecane and Taiwan levers, from 20 old moped shops inventory. TS vintage Italian controls are uncommon. They appear to be Domino compatible. 1979-85 General (made in Taiwan by Jui Li) and it’s clones Grycner, Clinton, Jui Li and others use the same brake levers as 1977-83 Honda Express. 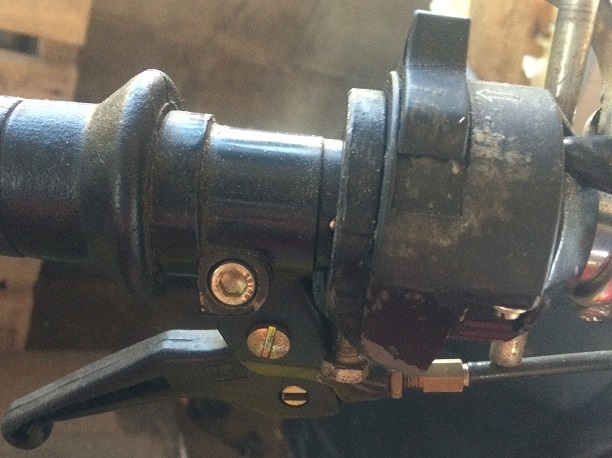 The brake lever housings are integrated with the electrical switches, all in one unit. 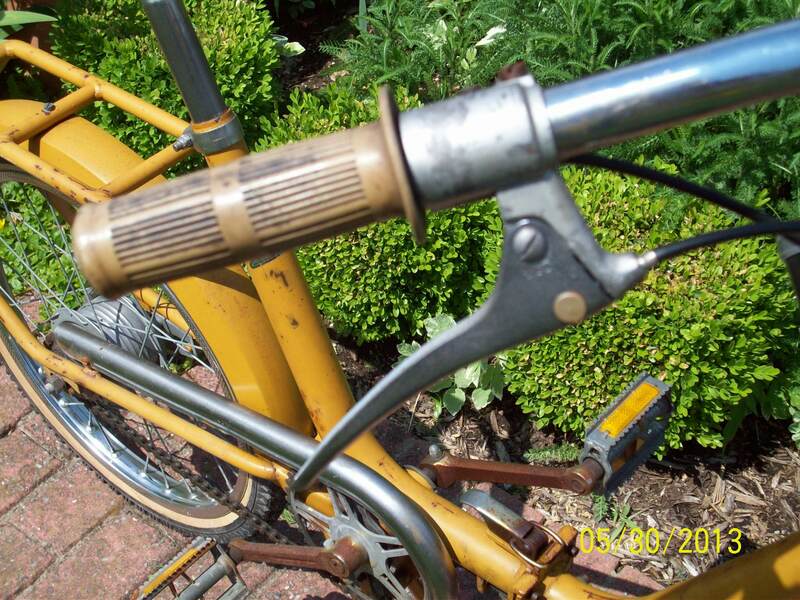 1977 Lazer (made in Taiwan by Jui Li) uses the same brake levers as 1967-68 Honda CT90. 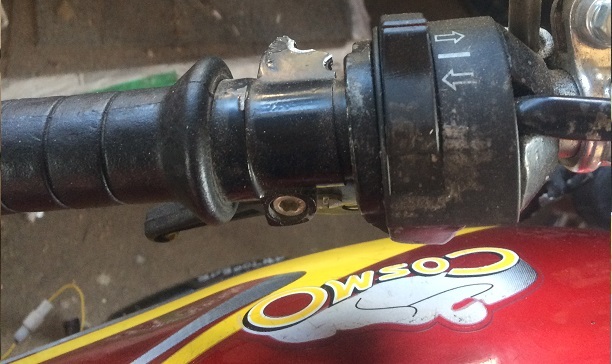 The brake lever housings are separate from the electrical switch housing. The electrical buttons are near the riders thumbs. 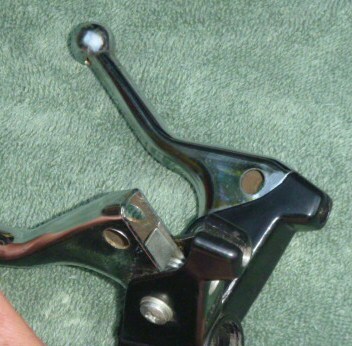 The brake levers are about 1.5 inch longer, because the lever housings (perches) are 1.5 inch further inward on the handlebar. Lazer levers break easy, because they are only 6mm wide at the pivot. 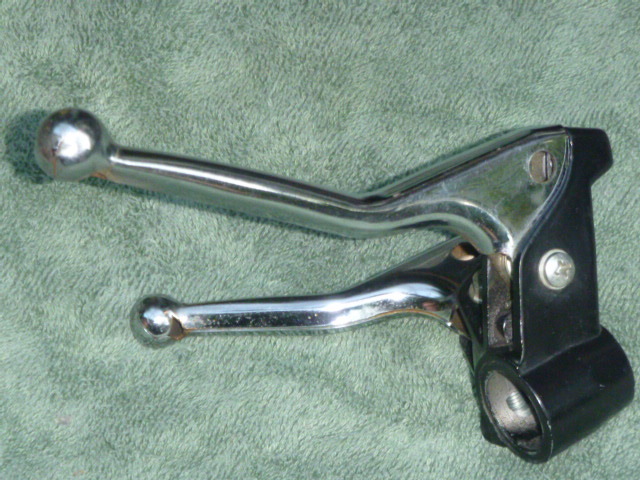 Most other vintage Japanese small motorcycle hand levers are 8mm wide at the pivot. The search for compatible “thin” vintage Asian levers is ongoing. 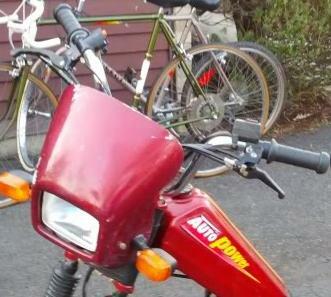 The goal is to find replacement levers for early Hondas and compatibles, like the 1977 Lazer moped. 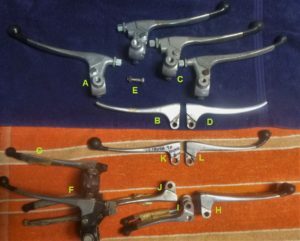 Vintage small Honda levers, all 5.5 to 6.5mm at the pivot, but different leverage distances, pivot hole diameters, cable hole diameters, perch “stop step” shapes, blade lengths, ball end styles. Avanti Mont left control, Tomos HR right? You are currently browsing the archives for the Other Controls category.